The main objective for any Public Works department is to cost-effectively optimize resources – these include employees, equipment, materials, contracts, and physical assets. Best business practices for planning, organizing, directing, and controlling need to be implemented and followed. Orange County, California has successfully used various maintenance and operations service providers, including a combination of in-house/force accounts, outsourcing, job order contacting, and incarcerated labor. Orange County, with about three million people comprises 798 square miles. The County is the State’s densest and third most populous, with 34 cities, 321 County road miles, 350 channel miles, 7 pump stations, 4 dams, and 283 road miles for contract cities. Orange County (OC) Public Works is in charge of most of the County’s infrastructure such as roads, building facilities, flood and storm water channels, and traffic control devices. The Department employs approximately 1,000 people and manages a $457,000,000 budget and is comprised of six service areas, with Orange County (OC) Engineering charged with maintenance and operations of both County and contract cities’ roads, in addition to holding the responsibility for County wide flood control and roadway traffic control areas. 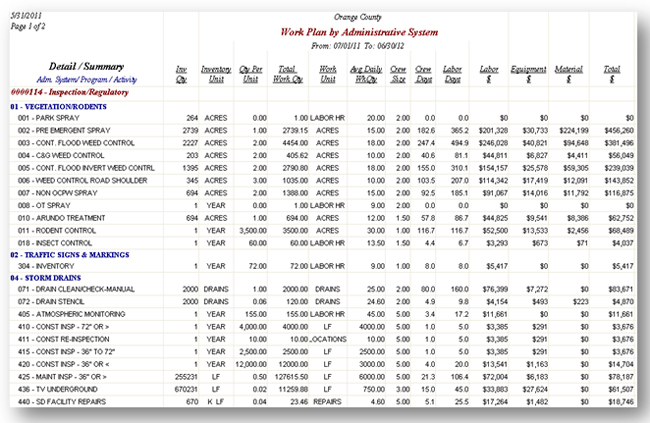 Orange County Public Works’ Operations and Maintenance Department has had a management system in place for over 30 years. 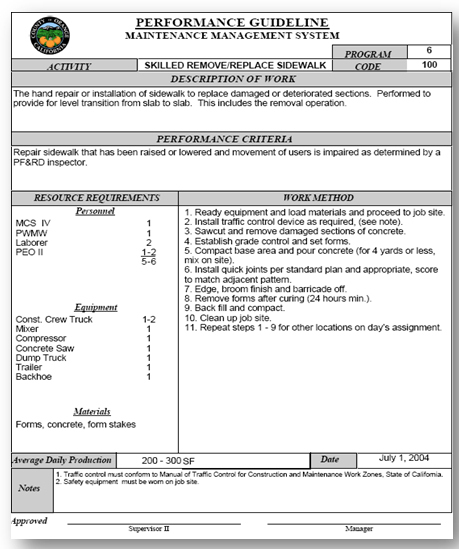 The approach, outlined in the flow chart in Figure 1, is cited in the American Public Works Administration Manual (2008). OC Public Works utilizes this process to manage all work done on its flood channels, stormwater facilities, roadways, and traffic signs and markings. The process requires a methodology that is independent of the service provided. The above figure shows four management phases that can be implemented using a three-step approach. The initial step is to determine what work is needed and generally what time of the year it should be done. The annual plan determines, by activity, the amount of work and related costs that are anticipated. Standard documented work practices and processes with activity, crew complement, equipment, resources, and target production are required to project all work annually. Staff availability and maintenance must be evaluated. 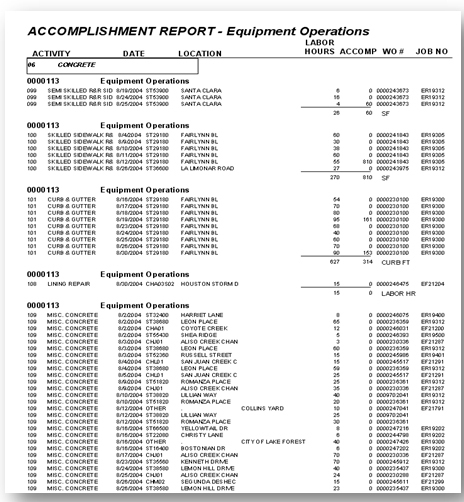 Figure 2 shows activity guidelines including crew (personnel), equipment, materials, and average daily production (target production). This guideline is a key element of the County’s approach, as it establishes the basis for annual performance planning, along with asset inventory, levels of service, and resources. Condition assessments, work to be performed, and frequency/level of service (time drains cleaned, etc.) will determine the work plan of needed work. 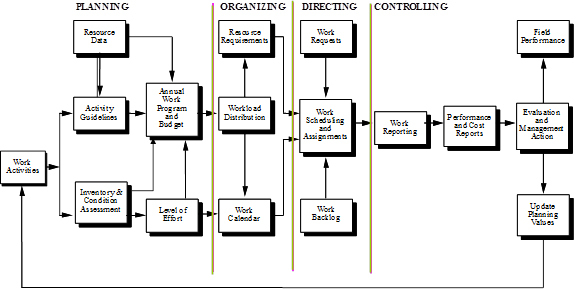 An annual work plan is illustrated in Figure 3. Work units, resource requirements, labor, equipment, material, and contracts can be determined by the work plan and related budget limitations. With use of the annual plan and the knowledge of the time of year the work is to be done, an estimate of the work can be determined, along with the required resources to perform current and desired work. Scheduling is part of the directing phase in maintenance management, using work backlog and the identified work orders. The annual plan is translated into a short-term schedule (normally one to three weeks) by maintenance supervisors. Looking in-house first to accomplish work is an important step in directing work. Different tools for multiple jobs need to be explored, either by in-house staff or outsourcing, to determine the most efficient option. Reporting and tracking of work which is in the controlling phase of maintenance management is used to evaluate performance that allows the necessary changes to improve performance to be determined, modified, outsourced, and adapted into the new annual work plan and performance plan. Reporting and tracking work includes documenting the activity, date, location, work order number, job number, and cost; this helps to allow for the responsible use of resources. In the monthly reporting process, a maintenance management system can look at cost, unit cost, productivity and hours by location, activity, program, account, work order, supervisor, and inspector. Evaluation tools are useful in establishing annual goals for accomplishing activities. 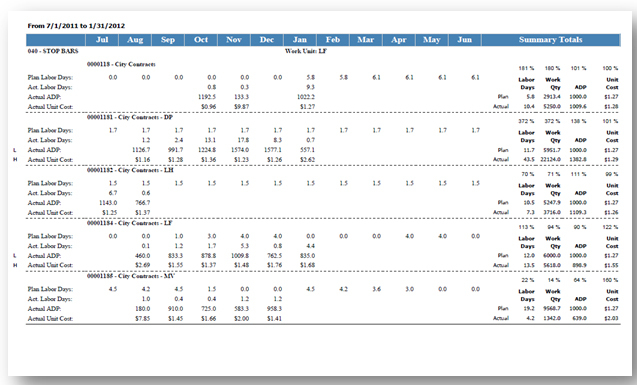 Planned information can be compared to actual results; this helps the monthly and annual review of unit costs and productivity. Proper adjustments can be made to planning and use of resources if accurate evaluation tools are used. Field performance is an important indicator of how well a department is managed and the customer service that is provided. The process outlined in the first two steps is used for all work, regardless of service technique used. The effort outlined is focused on internal resources. Now, let’s look at other options. In determining how best to perform the work, different providers should be considered. Key factors include the amount or priority of needs, and the amount of in-house staff available. Figure 4 is a guide from AASHTO (American Association of State Highway and Transportation Officials) and provides some ideas in this area. In a situation where there are high needs and low staff availability, outsourcing will make the most sense. Alternatively, where there are low needs and high staff availability, using in-house staff is best. The work calendar, workload distribution, and resource requirements are all part of the organizing process. Also, balancing the available labor and equipment to do the work is critical. At this point, you should know what the needs are, the resources you have to get what you need done, and the alternative available to you for getting the work done. In addition to internal support you have some other options. There are multiple reasons to outsource, as shown in Figure 7. This figure, compiled by an APWA survey, shows the 10 different reasons why agencies use contracts. As depicted, the decision to use outsourcing varies by asset infrastructure type. 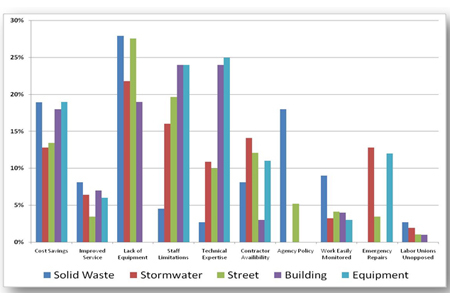 In fact, cost is only the fourth most common reason used by the APWA respondents, while most common issues that were indicated were the lack of equipment, staff limitation, and technical expertise that prompted outsource various tasks. Controlling costs, adding new services, and the need to enhance existing programs may all be factors in the decision to outsource as well as the need for maintaining response capabilities which utilize expensive specialty equipment. Managing work in a competitive environment may also be a strategy used for using some outsourcing effort where direct, strong, and available competition is occurring. If cost is the driving force, there are several factors to consider – either to perform work in-house or to outsource. These include avoidable (direct) overhead, labor, material and equipment rates, and administrative cost to outsource. Public Works managers can then calculate the internal cost (IC) = labor + equipment rates + material + overhead. The Contract (CC) = contract cost + cost to administer. If the department cannot do or does not have the time or IC >CC+5%, a contract should be considered. The additional 5% in the equation should be considered due to all of the costs to transfer service, other administrative costs, and internal costs that are not quantified. Contractors can be used for both routine and response work. Types of work that are outsourced or contracted include tree services, asphalt maintenance, fence repairs, concrete grinding and repairs, channel cleaning, and street sweeping. These tasks can require special equipment and expertise that a public works department may or may not have within the department. The size of the public works department can dictate what and how much work is outsourced. If work is outsourced or contracted, contract support needs to be in place which includes in-house contract inspectors. There are multiple ways to procure a contract, but typically they are bid on an annual basis with four, one-year extension options. Standing contracts allow services to be performed at an agreed upon rate for a specific amount of time. Outsourcing impacts the department and requires managing contractors. Supervisors can benchmark other programs in order to evaluate performance of the department. It also allows you to develop and maintain processes. If the outsourcing option is selected, an estimated cost of 10-15% to administer in-house must be budgeted. Further, work should be scheduled regardless of which resource option is being used (contractor staff or in-house staff). Before a contract is awarded, contractor response time, and reporting requirements should be defined and understood. Quality control must be monitored regularly. If favorable results are yielded from outsourcing, contracts can be kept to longer terms which can decrease contract changes, interruption of services, and time and money to procure other contractors. There are also opportunities for public works departments to be contractors. Does your department do a particular task well or have the assets/resources to complete task costs effectively? Can your department be a source of revenue to offset taxpayer costs? Can you collaborate with other local public works departments? If outsourcing is done properly, it can be advantageous. Contracting can yield lower cost and will allow you to supplement available resources. In addition, local, minority, and disadvantaged businesses can benefit from public works contracting. These businesses can also provide specialty services. There are many advantages to performing work internally. 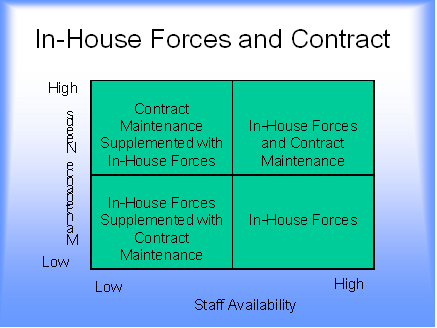 In-house/force account work often incurs lower costs (on large volume jobs). Further, it utilizes existing resources that are already available. The quality of work and response can be more closely monitored, as employees work for the agency, are aware of specific criteria, and can be made accountable. County staff is focused on the customer and has an understanding of historical and current issues. For example, a county employee would be aware of a particular channel or roadway and understand the issues for residents or environmental groups of a particular plant of concern, while an outside party not knowing the areas would most likely not take this into account in either performing or reporting the work. Further, city staff is uniquely aware of the current and past political concerns that must be addressed. Finally, but no less important, is the flexibility in-house staff can provide, such as the ability to respond without having the contractual and administrative restraints (i.e. language to meet specific needs) that a contactor would have. Contracting often times requires a lengthy and time consuming procurement process and may be even more costly, depending on your in-house capabilities. Acceptable response times need to be evaluated and established at the outset to ensure reasonable customer service. To ensure maximum value, a comprehensive scope of work must be determined and this requires support to manage and administer, which is estimated at 10-15% of the effort. Contract administrators/inspectors must have knowledge of the contracted trade to properly administer. Consideration must occur for capability to do work done in-house if the contacting effort fails and can create unnecessary liability. The County has to maintain some adequate skill set abilities to perform basic operational functions. Firm, fixed price: All tasks are listed in a unit price book with descriptions, unit of measure, and a price to install or demolish the task. Competitively bid: All bidders submit a set of adjustment factors to the fixed prices in the unit price book. Indefinite quality: The contract is for a fixed term and has a guaranteed minimum dollar value and an estimated maximum dollar value. No projects are identified at the time of bidding. Contract: A contract agreement between the agency and the contractor is executed with typical boilerplate language and JOC specific language for the master contract. Construction task catalog that assists the agency in identifying individual construction task to be included. A price is established for each task that includes local prevailing labor rates and material and equipment prices. The task represents the “Scope of Work” for the contract. Technical specifications with a coordinated construction task catalog gives bidders confidence in the pricing structure of the JOC process. To realize optimum savings and control, it is essential that each construction task is tied to a concise technical specification. Contract terms, conditions, and bid documents: Critical document must accurately explain the JOC process. Some standard clauses need to be modified for JOC and poorly drafted contract language increases the risks and costs. The agency needs to establish several items up front. A fixed initial term is established usually for one year with possible options to extend. Along with an established guaranteed minimum dollar value (typically $25,000), the agency determines a pre-established maximum value. This represents the expected amount of work to be accomplished based on the public agency’s budget. During this process, the Agency does not identify or commit to any specific project or location, or to any specific quantities or tasks in the catalog of construction tasks. During the competitive bid process, each contractor must bid adjustments factors to be applied to the unit prices published in the Construction Task Catalog. The two common factors that are used are normal working hours (e.g. 7:00 A.M. - 3:30 P.M., Monday - Friday) and other than normal working hours (evenings, Saturdays, Sundays, and holidays). Adjustment factors must include all overhead and profit which are fixed for one year. In addition, the same adjustment factors apply to every task in the construction task catalog. Finally, the contractor with the lowest, responsive and responsible bid is awarded the JOC contract. After the competitive bid process is complete and the JOC contract is awarded, the process of moving forward begins. A joint scope meeting is held where the agency and the contractor (and subcontractors in some cases) jointly develop a detailed scope of work that is finalized by the agency and states the level of documentation required for the job. The contractor is responsible for preparing a price proposal, which states the cost of each project using the unit prices times unit quantities times the appropriate adjustment factor. At this point, the price is fixed, always based on unit prices and never negotiated. The contractor develops a schedule, list of subcontractors, and submittals. Jointly, the contractor’s price proposal and other information is reviewed and approved. The lump sum job order is issued by the agency and the risk of performance lies with the contractor. No adjustments or quantities are allowed after the job order is issued. JOC saves a significant amount of time and money in the cost of construction, lower procurement and administrative costs, fewer change orders and claims, and reduction of architectural and engineering fees. It also increases the quality of the job and allows for the use of local, minority, and disadvantaged businesses. JOC cost savings are maximized because the contractor can offer discounts due to the bidding of a large volume of work. Overhead and profits are spread over the entire value of the contact. JOC eliminates the need to use the full procurement cycle for each and every project. Fewer change orders and claims result, and the joint scoping process eliminates misunderstandings about the detailed scope of work. The contractor is responsible for the errors and omissions due to the detailed scope of work and JOC general conditions written to make the contractor responsible. The contractor derives advantages from a JOC situation as the contractor is guaranteed a small amount of work initially, yet there could be potential to earn substantially more. The key to earning more business is performing a good quality of work that is delivered on time. Public Works departments are challenged with getting work done whether it is in-house, by others, or through job order contracting. Getting maintenance work done means getting the required work completed within your allocated resources, while serving the public effectively. Best business practices for planning, organizing, directing, and controlling are strategies that can be used in determining whether in-house, contract work, or job order contacting is the best option. If your department can be resourceful, thoughtful, and creative, many options for getting maintenance work done can be implemented. Victor Valdovinos is the manager of Operations and Maintenance for Orange County Public Works. Contact Mr. Valdovinos at victor.valdovinos@ocpw.ocgov.com. The Orange County Public Works/Operations and Maintenance Division provides a wide range of maintenance services to Orange County’s unincorporated areas, 350 miles of flood control channels, 4 dams, 7 pumping stations, 319 road miles and other infrastructure such as maintenance trails and retention basins, along with several contract cities. Harry Lorick is the principal of LA Consulting, Inc. Contact Mr. Lorick at hlorick@laconsulting.com. LA Consulting, Inc. was established in 1993 and provides a wide variety of planning, systems, and technology services applied to public agencies and municipalities with an emphasis on systems implementation and technical support for public works operations and maintenance. Corporate headquarters are located in Manhattan Beach, CA.